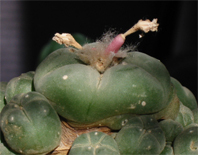 My grafted Lophophora koehresii (RS 1182; El Sabino, San Luis Potosí) just flowered for the first time this growing season. 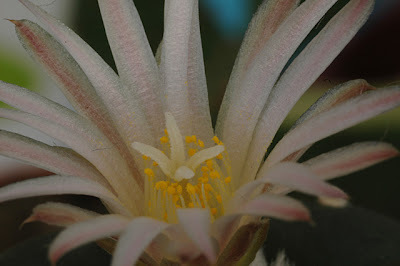 The light pink flower with unusually thin petals having a darker midstripe is true to the species. What appears to be a “double-flowered” variety with extra petals in the picture above is in reality just three flowers unfolding at the same time. The Lophophora koehresii scion was badly disfigured by spider mites but managed to outgrow some of the scarring after I started showering my plants regularly and treating them with neem oil – a treatment I intend to continue this year as it seems to be an effective means of controlling the spider mites (and with a bit of luck the plant will outgrow its defacing completely in a couple of years). 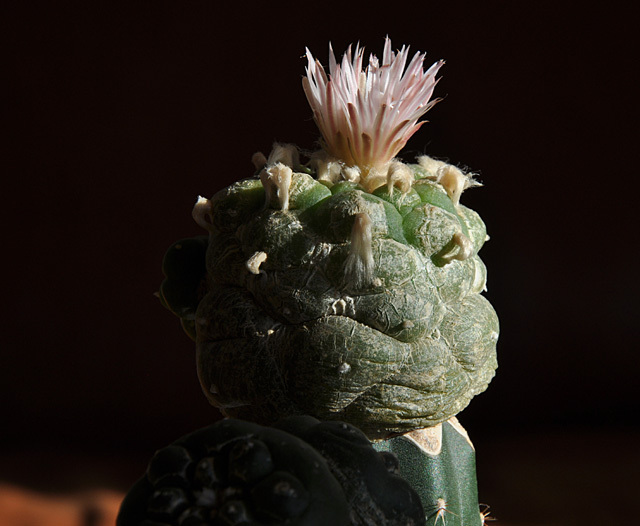 Back in August this year my grafted Lophophora diffusa var. koehresii (RS 1182; El Sabino, San Luis Potosí) flowered for the first time. 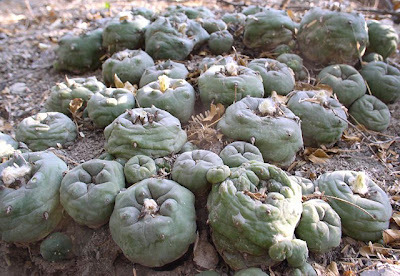 Despite the difference in size of the two Lophophora diffusa var. koehresii scions in the above photo they were both started as part of the same batch of seeds March 3, 2007. 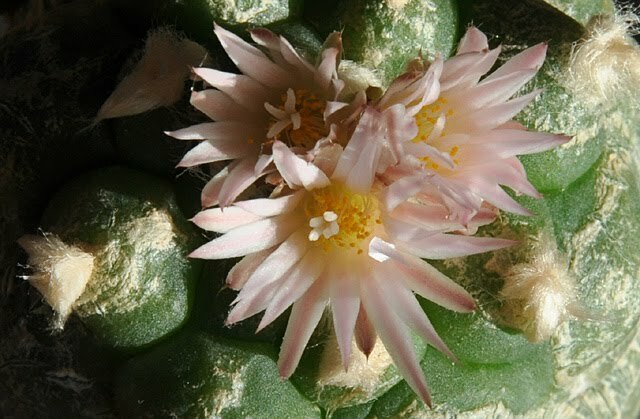 The largest of the scions was grafted June 7, 2007 and when the Trichocereus pachanoi stock grew an offset I grafted another seedling on it May 5, 2008. 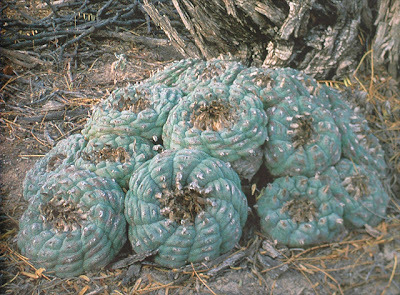 Lophophora diffusa var. 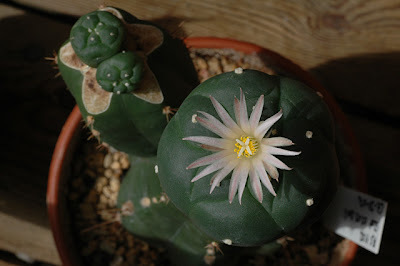 koehresii is described as being of smaller size than the other Lophophora species (possibly with the exception of the newly described Lophophora alberto-vojtechii), and having a dark green epidermis and pinkish-white flowers with a light brownish mid stripe. 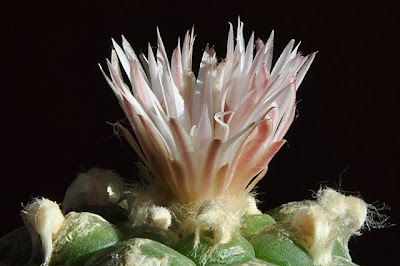 The flower and epidermis of my plant fit the description while it might be difficult to say anything useful about size as the plant is grafted. 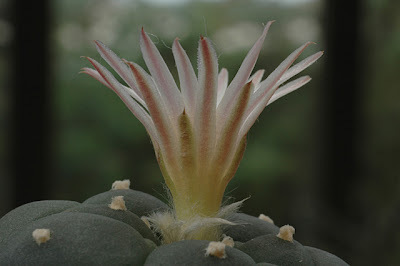 As mentioned above the plant is still very young but I'll watch it closely as it matures.